Replacement blades for Kioti, Phoenix, Sicma, First Choice, John Deere 60 cut Finish Mowers. 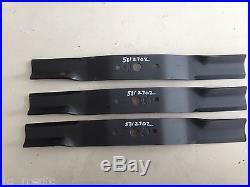 This listing is for three (3) replacement blades that fit models GM30-60, GM-RD60. These are high quality balanced blades from an Italian company known for making a quality product. These balanced blades provide for smoother operation and longer life. Will not fit the Korean version of the Kioti Finish mowers, will only fit the Italian version! These blades are 20" overall length, are 2-5/16" wide, 0.240" thick and have a 3/4" Round mounting hole. 20-1/4 Cutting Tip to Cutting Tip. Balanced to Ensure Smooth Operation. We sell replacement blades, belts, wheels and more for most brands of finish mowers. We are listing new items frequently so please check our store often. Your complete satisfaction is important to us, should you have and problems please let us know so we can correct them. If you have any question about the part you need, please call first we will be glad to answer your questions. All parts are guaranteed to meet with your approval! The item "Kioti Sicma WAC Phoenix First Choice 60 Finish Mower Blades, Set of 3, 5812702" is in sale since Friday, September 12, 2014. This item is in the category "Business & Industrial\Heavy Equipment Attachments\Mower Decks". The seller is "ag_medic" and is located in New Richmond, Ohio. This item can be shipped to United States.